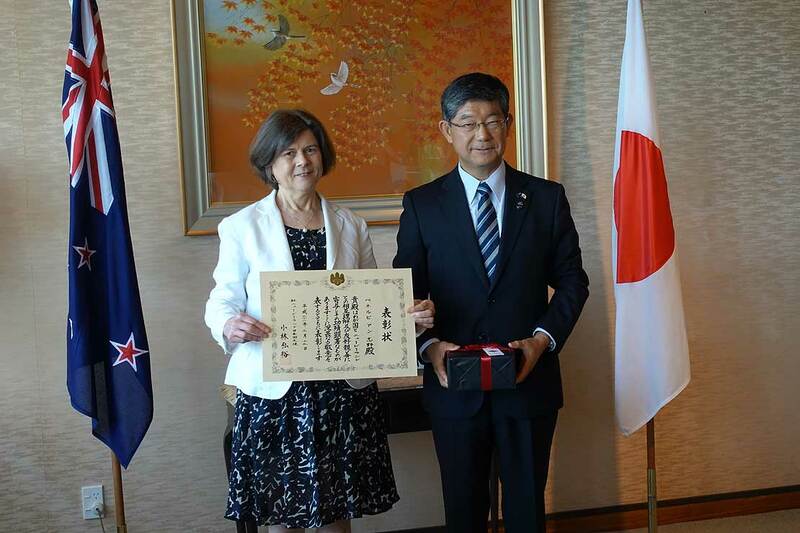 Dr Penny Shino receieves her award from the Ambassador of Japan to New Zealand, Mr Hiroyasu Kobayashi. She was among the first generation to learn Japanese at secondary school in New Zealand – now Dr Penny Shino has been recognised for her outstanding work teaching and inspiring the next generation. She was one of six recipients and the only one from the university sector. Two other recipients were her former distance students. At the University of Auckland, she majored in Japanese and French, enjoying both. A short study trip to Japan at the end of her second year tipped the balance in favour of Japanese, followed by a two-year government scholarship to Japan after she graduated. Dr Shino spent six months studying Japanese at the Osaka University of Foreign Languages (Osaka Gaikokugo Daigaku, now part of the University of Osaka) and 18 months researching 10th century classical Japanese poetry at Nara Women's University (Nara Joshi Daigaku), for her Masters. “Although I spend most of my time these days teaching modern Japanese, my real love is for classical Japanese language and culture,” she says. Returning home after three years with a baby on the way, she did some tutoring and embarked on a PhD analysing poetry by a fifteenth century Zen monk, taking up a lectureship at Massey in the process. She is currently researching the same poet's travel diary. As well as convenving Massey’s Japanese language programme from her base in the School of Humanities on the Manawatū campus, she is deeply involved in the initiatives of Japanese Studies Aotearoa New Zealand. It was established by a group of academics from tertiary Japanese programmes at a symposium she organised at Massey in 2013. Dr Shino was elected inaugural president and is now in her second term. In this role, she has organised symposia for academics as well as workshops for school teachers of Japanese, in cooperation with the Sasakawa Fellowship Fund for Japanese language education. With colleagues across the land, she has worked hard to maintain and raise the profile of Japanese in New Zealand; “at a time when interest in language learning is facing a number of obstacles, not least of all a perverse and deeply-ingrained mentality that English is the only language we need. She is delighted that this year, enrolments in first-year Japanese – offered at Auckland, Manawatu and via distance – are “unprecedented” even when compared with the boom years of Japanese studies in the 1990s, when Japan was the most popular the foreign language. Dr Shino thinks the Rugby World Cup in Japan this year, and the Tokyo Olympics and Paralympics next year, may have generated heightened awareness and publicity of Japan – and this surge in interest is also the focus of her MURF-funded study. This positive trend has prompted Massey to launch a Japanese 'nanocourse' outside the conventional qualification structures, to be offered online later this year. “The course will serve the needs of athletes, their support crews, other professionals and family members travelling to Japan for the Rugby World Cup and the Olympics and Paralympics, teaching a little practical basic Japanese language alongside some cultural orientation, to make the experience in Japan as enjoyable, comfortable and fulfilling as possible,” she says. When it comes to Japanese and jobs, she says the market is very different today, with more diverse opportunities. While few graduate with a specific career in mind (except the small group seeking traditional roles in teaching, academia, diplomacy or translation/interpreting), she says Japanese gives any graduate a competitive edge in a range of jobs and for this reason many students study Japanese alongside a more vocational or professional qualification, such as Business, Aviation Studies or Sports Management, completing Japanese as a second major, a minor, or even two or three elective Japanese courses.